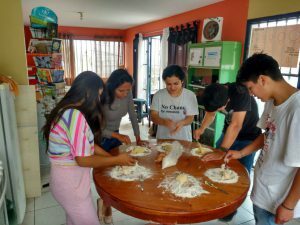 FairMail - Blog - ”How do you make home-made pasta?” – Kzanier asked. In FairMail we do like to experiment, a lot. Be it with photography, craft, games or adventures. Trying out new things helps us step outside our comfort zone and gives us the chance to find out things that we love doing and realize our full potential. Most of the times our extra-photography activities are carefully planned in advanced, some other times they happen at the spur of a moment like this one time when photographer Kzanier – out of nowhere – asked: “How do you make home-made pasta?” FairMail Italian director Federica just couldn’t leave the question unanswered and she improvised a pasta making workshop at the office. Not later than half an hour from the unexpected question, we were all standing at the table with our eggs and flour ready to learn. 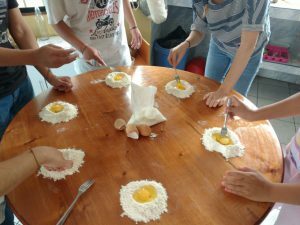 Pasta making is a major Italian tradition that requires a set of skills like dosing the right amount of flour, kneading the dough, rolling and cutting it, not exactly a piece of cake for beginners! We were amazed by how committed the teenagers were and the results left us speechless. Despite the inevitable difference in texture, the noodles turned out just fine and we enjoyed them topped with an eggplant-carrot tomato sauce!